As we have seen the different way of wedding such as wedding in the air during sky diving, under water wedding in ocean during scuba diving, wedding in the highest peak of the world, Mt. Everest during expedition any many more unique ways to cherish the moment for lifetime. The traditional Thai wedding is one of those experiences to gather. Marrige in Thailand is call reckoned as a Buddhist religious ceremony of traditional Thai wedding with several unique rituals observed step-by-step. To comply with Buddhist religious beliefs, most Thai girls (and especially the parents) would be very happy to have a marriage ceremony of traditional Thai wedding, albeit the fact that it is not legally recognised as a marriage. When planning a wedding, stress is a common factor that all couples will experience. Worries about the weather, the right venue, and the rapidly rising costs of ceremonies, receptions and honeymoons, together with any social and personal expectations can all add unwanted pressure. These reasons and more, may be why many couples look to escape such pressures and get married abroad. We believe that it’s your special day and it should be an occasion that you both enjoy, and remember, for all the right reasons. Your wedding day is personal to you and in the years to come, you and your partner should look back and treasure every moment of your day. 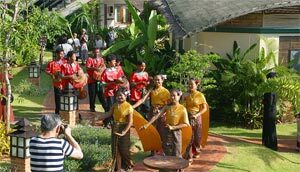 Silk Road Group - to do all the hard work and organisation, allowing you the freedom to relax and enjoy your stay in Thailand. Our staff are experienced, well trained and above all, dedicated to making your wedding exactly the way you want it to be. Here you have a destination with something to please everyone. Centrally located between Europe and Australasia, you could combine a holiday with friends and family; your wedding ceremony; and your honeymoon - all in one unforgettable stress-free visit. In recent years, Thailand has become one of the world's most popular travel destinations for weddings and honeymoons. Many couples choose Thailand because they wish to tie the knot in a land renowned for its sense of grace and style, following customs and ceremonies with rich roots in Buddhist culture. The secluded, all-inclusive resorts are perfect for honeymoons. Wedding planners, either independent or affiliated with tourist hotels and resorts, offer highly personalised services in choosing and arranging the most appropriate activities and events for each client's taste and budget, such as traditional Thai wedding costumes and ceremonies or more contemporary, custom-designed events. Please Just tell us as much as you have in mind: your special desires, your budget, how many days, the destinations you prefer, how many people in your group, what kind of rooms, and any other special requirements. Our travel consultants will help you to make the most of your travel time and your affordable amount. For more details information about wedding Traditional Thailand please Contact Us.